Product prices and availability are accurate as of 2019-04-04 16:41:34 EDT and are subject to change. Any price and availability information displayed on http://www.amazon.com/ at the time of purchase will apply to the purchase of this product. We carry only the Highest Quality Aluminum and Embossed Aluminum signs that are manufactured today! 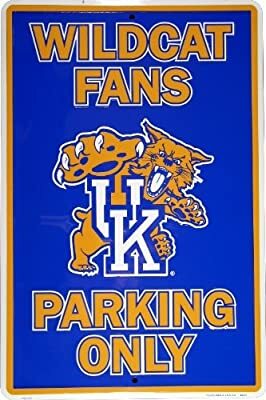 Lightweight and Durable â€" these fun and unique sign can be put anywhere and are sure to generate lots of fun conversation too! Each item individually shrink wrapped w/drilled holes for quick and easy display and mounting! Hang this on your front door or entry way, garage, man cave, bedroom, den, college dorm, home office or theater - The possibilities are absolutely endless! Have fun and express yourself! Great For Indoor or Outdoor Decor. Made of the highest quality aluminum metal Lightweight and Durable. Available at considerably low prices (considering their beauty and quality reproduction), these signs are the perfect aesthetic investment for decoration. Offering entertaining and beautiful pop art on a sustainable piece of aluminum, collectible signs such as these are long term furnishings that never go out of style, never go out of fashion, they are truly vintage in every sense of the word. We make all of our signs as they are ordered. Recently we have been extremely busy. Because this happens occasionally , we ask in our listings that you allow up to 10 business days for your sign to ship. I appreciate your patience.